For some, ordering wine in a restaurant is an ordeal that provokes embarrassment, or fear of ordering an expensive bottle so as not to appear cheap or ignorant. And it’s ironic, because it’s been made that way by the very people who need to make wine fun for the average consumer. Yet the process of ordering wine, and having it served to you, is actually very simple and straightforward. Here are some particulars. Let’s talk about why wine costs so much in a restaurant. The main reason is simple: most restaurants that serve wine make most of their profit from wine by marking it up from about 100 to 300%. And remember, they are paying wholesale, not retail, to begin with. And if you’re ordering wine by the glass, you’re really helping the proprietor because the markup on wine by the glass is typically even larger. So you might be a lot better off buying an entire bottle, assuming the diners can all agree on a choice. You’ll also find, if you dine out a lot, that there’s a big difference in the percentage of markup among restaurants, depending on the type of restaurant, whether it’s a casual or fine dining place, and of course where it’s located. For example – assuming you can find it – you might pay $175 for Robert Mondavi Napa Valley Reserve Cabernet 2001 at a restaurant in Dayton, Ohio. At Bobby Van’s steakhouse in New York City, however, you might pay $250 for the same bottle. Of course there is a lot more “cache” to dining in Manhattan than Dayton, and the cost of operating a restaurant in New York is maybe double that of Ohio. So Bobby Van’s may in fact be realizing less from that same bottle that costs $75 more. Another rule of thumb is that the more expensive the wine, the less it’s marked up. So if you’re into fine wine, and you can afford a little splurge from time to time, buy a better quality bottle of wine when you’re dining out, and you’ll usually be getting a better deal. Now, in places like New Jersey, you might be able to take advantage of a Bring Your Own Bottle (BYOB) restaurant – I’ve never seen a state where there are more. Anyway, when you bring your own it generally doesn’t cost you a thing, and you’ll still get some kind of wine service; typically your waiter will open the bottle for you just as if you’d purchased it at the restaurant. Sometimes the glassware will be lousy, and they may or may not not refill your glass, but that’s a small price to pay in return for saving a LOT of money. Finally, you might patronize a restaurant that has an extensive wine list and yet you still want to bring your own. Some restaurants simply won’t allow that; for example, I brought an old, very rare bottle of Haut-Brion to the Borghata Casino in Atlantic City a couple years ago to celebrate a friend’s promotion. It was a pretty special occasion and he had even flown us in by helicopter, the rare bottle safe in one of those wine luggage boxes you see in catalogs. I was hoping there’d be a corkage fee so that we could enjoy the special bottle, but the wine steward, who by the way was haughty and rude, absolutely would not even consider letting me pay a fee for the privilege. So, the lesson here is if you want to bring your own to a place that has a liquor license and serves wine, call ahead and find out if they have corkage. I’ve seen corkage fees range from as little as $10 in some places, to $100 in New York City’s high-end restaurants. First, when eating out, take advantage of the Sommelier if your restaurant has one. In some restaurants this person may be called a “Wine Steward” and in others, the Maitre D’ may serve this purpose. But without or without expert help, begin by making an effort to pick wines that will enhance and complement your food. And start by estimating how long your meal will last and how many courses you’ll have – you may want to order a half-bottle of a Chardonnay or sparking wine for your seafood appetizer, and a half-bottle of Meritage or other hearty red for a main course of filet mignon or lamb. If you’ve set a budget for the evening, keep this in mind when ordering in order to get the most bang for your buck. Do some simple math, too, if you’re considering ordering by the glass. A standard 750ml bottle holds enough wine for four full glasses, so if you’re going to order more than 3 glasses, you’ll do better to buy the entire bottle and enjoy the wine service! When the Sommelier or server brings the bottle, he or she will present it to you for approval. And while you should dispense with the elaborate ritual in which everyone sits stiffly, holding their breath, don’t forego the other parts of the process. This is actually a valuable exercise, helping ensure that you get just what you ordered and what’s priced on the wine list. Unfortunately, that matters because far too many restaurants will substitute a different vintage (year) if they’re out of the one listed, so pay attention to vintage date and producer. On occasion this can work to your advantage, but more often than not the substitution will be from a lesser year. Despite what some restaurants tell you – and some that even post a disclaimer on their menus – they’re not at liberty to give you a different vintage than what’s listed…at least not without your permission. And if they’re going to present you a lesser-quality bottle, it ought to be at a “lesser-quality” price. Some restaurants that practice this bait-and-switch technique and were called on it have stopped listing vintage dates at all, so if the vintage is not listed, be sure to ask and agree to it before you order. One other reason to look at the label is to see how it has been stored. A label that is very dirty, faded or has disintegrated may indicate that the bottle has been stored incorrectly or in a cellar that was flooded or otherwise damaged. Of course this isn’t an exact science, and you could very well order an old bottle of wine that is marvelous but whose label had deteriorated solely from age. Use your judgment here, but don’t feel compelled to open and drink a bottle if you have any reason to question it. Once you’ve seen the bottle and agree that it’s what you ordered, just say “that’s fine” or “correct, thank you.” If you don’t agree then say why you’re not pleased with the bottle. Don’t allow the server to open the bottle at this point, and be sure to make that clear; it’s a lot more difficult to deal with this situation after the bottle is open. 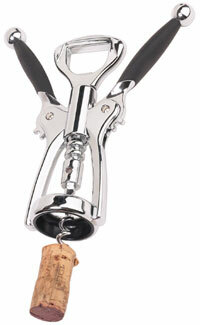 Once you tell the wine steward “OK,” he or she should remove the foil capsule’s top, and then the cork. Sometimes the cork will be presented in away that suggests you should surgically examine it, run a CAT scan and have the vapors emanating from the cork analyzed. Don’t. Even if you’re a radiologist. This part of the ritual is silly, because you can’t tell much from the cork unless it’s entirely covered with mold, or so dry that it disintegrates in your fingers. OK, if that happens, you might tell Houston you have a problem. Of course, it’s an unfortunate fact that 3% to 7% of all wine bottles sealed with natural corks will have been “corked” or tainted by TCA (2,4,6 Tricholoranisole), giving the wine a musty, moldy character that some folks says smells like wet newspaper. As a veteran newspaper boy who delivered The Piqua Daily Call for a couple years, I am here to tell you that wet newspaper smells a lot better than corked wine. It might even taste better. Ironically, one of the things that contributes to corked wine is the sanitizing of corks, which can produce chlorphenol compounds that turn into TCA. Anyway, a cork from a perfectly good bottle of wine may have a little mold on the opposite end from the one that faced the liquid, and may just indicate that this is a fairly old bottle. So it’s more important that you smell and taste the wine than sniff or examine the cork. But the Sommelier will typically place the cork on the table to your right, often on a small silver platter. A nice touch, however meaningless. And he or she will usually remove the cork after he’s poured the first round for all the guests, since at that point the cork is considered trash. Sometimes he’ll present the bottle again, often with a white linen napkin behind it to show it off. Showing off is all it is, but it’s fun, too and makes you feel special. And you are. After opening the bottle, the server should pour a tiny amount of wine, about a half-inch or so depending on the size and shape of the glass, for the person who ordered the bottle, no matter who’ll be paying for the meal. Hey, the server doesn’t know who’ll be paying, anyway, and they shouldn’t assume. If the person ordering wants, he or she can designate another person to do the initial taste. But it’s not the server’s call, it’s yours. In all cases – no exceptions – the wine should be opened and poured in your sight. This is to make sure that there’s no substitution, that you are drinking from a bottle that wasn’t previously opened, and from a bottle that is clean and intact. I recently ate at a Japanese steak house, and after the waiter brought our bottle of Sauvignon Blanc, he ducked behind a partition to open it. I heard him making sounds as he struggled with the cork, and he emerged moments later with two filled glasses. I sent the wine back and asked him to open it properly, in our presence. Then I cancelled the order for blowfish and asked for shrimp instead. I didn’t just fall off the turnip truck, after all. Anyway, sometimes the server will finish each pour with a little flourish, a twist of the bottle that helps prevent dripping. It works, and you can do it at home with a little practice, but what is really important here is that the wine is not spilled or wasted. After your server has presented, opened and poured your wine, act like a professional taster – and that’s what you really are at this point…and hey, you’re paying! First, stick your nose as far in the glass as it will go without getting wine up your nose or looking like a buffoon. Of course, buffoonery can be enjoyable; just ask my friends. Then take three quick, deep sniffs in succession. At this point you are literally assaulting your sense of smell – to be precise, the olfactory tissue, olfactory bulb and finally your brain – with the aroma of wine. And from this, you want to be sure that the wine is not corked or otherwise tainted, and that it essentially delivers what you were expecting from the grape or grapes, the vintage, and the quality you’re expecting based on your knowledge, your taste, and of course the price. Naturally, if this is the first time you’re trying a particular wine, you may have no expectations other than what you may have read or what the Sommelier has told you. Then take a small amount of wine into your mouth. Focus your attention and senses on it. And, if you’ve practiced this at home or at tastings, swallow half of the wine and let the other half recede to the bottom of your mouth. Then open your mouthy slightly and carefully, with your lips pursed, and draw some air in. This will make a slight “whooshing” sound that may seem a little vulgar, but what you’re doing is drawing volatile elements (actually the wine evaporating) into your nasal passages to get a better sense of its character, flavor and finish. Now, you may want to modify that “whooshing” bit a little depending on your company and the kind of restaurant you’re in. And don’t overdo it in a showy way – you’ll look and sound like a camel at the well – but rather do it quietly and elegantly. Assuming you like what you’ve smelled and tasted, let the server know by nodding in assent or saying “this is fine.” But what if…it’s NOT? You can send a bottle of wine back (where in all likelihood the kitchen or wait staff will drink it anyway) if it’s truly bad – oxidized or corked. But that doesn’t mean that you can send a bottle back just because you or your dining companions aren’t so fond of it. That’s not only tacky, it’s downright dishonest. If you do think the bottle is truly defective, then my all means summon the Sommelier and ask him or her to smell and evaluate the wine. In some very high-end restaurants, anyway, the Sommelier will have tasted it anyway and won’t pour for you until she or he thinks it’s fine. But if you’ve simply tried Pinot Noir for the first time, and you decide that you don’t like it’s “earthy” quality, you’re stuck. The one exception to this rule is if the Sommellier chose the bottle for you and you are really put off by the taste, meaning it’s very different from what you were told to expect. Here you have to use common sense and be decent about it. Nothing can spoil a good bottle of wine as much as a dirty glass, especially one with soap residue. And sometimes, restaurants will bring you a freshly washed glass that is still dripping wet. Well, don’t accept it. Stemware should be dry and perfectly clear, with no hard water haze or visible dust, and no smell whatsoever inside the bowl. Keep sending your glass back until you get one that’s immaculate. Also, make sure that the glass is large enough to swirl without splattering yourself and your friends with wine. Much to my chagrin, even fine dining establishments often provide stemware that is inappropriate for enjoying wine. Now, the good people at Riedel (pronounced Ree-duhl) and other makers of crystal will tell you that you have to have a different and uniquely shaped and size glass for each type of wine. Well, that’s hooey (one of my favorite words, you’ll notice). Now, Riedel makes some wonderful stemware – I’ve got some in my cellar – and it’s fine, thin glass that’s a real pleasure to drink from. But there’s just nothing to support the notion that Bordeaux needs a glass that’s dramatically different from a glass meant for Burgundy in order to enjoy either. The 12 ounce tasting glass shown here is suitable for any kind of table wine. But please note the shape; it’s important for your full enjoyment that the glass tapers inward towards the top so that the aromas don’t escape and so that you can swirl the wine. Ideally, a wine glass should always have a stem, which makes it easier to hold, keeps fingerprints off the bowl, and keeps your hand from warming the wine in the bowl. Some restaurants, especially those that feature country-style Italian or French food, often serve wine in what amounts to a tumbler, either straight or flared at the opening. And even the status-conscious folks at Riedel offer the “O” series, which has the proper tapering but no stem. But I’d avoid these unless they’re your only choice. Frankly it’s just a lot more fun to drink from a proper wine glass! Most Americans drink their whites too cold, and their reds too warm, and they usually insist on replicating those mistakes in a restaurant. This comes from the fact that at home, people typically serve whites directly out of the refrigerator, and reds right out of the bottle at room temperature. Neither is correct, and for that you pay a big price in aroma and flavor. Reds that are too warm will be overrun by their alcohol, and lose the delicate flavors and aromas of the fruit. And you’ll taste only the acid with whites that are too cold. But there’s an easy fix: let whites sit on the counter for a 15 minutes, and immerse your reds in an ice-water bucket (not just ice) for 5 minutes before serving. This will help ensure that you smell and taste everything that the wine has to offer. In a restaurant, of course, the wine and wait staff should know better, and should serve wine at the proper temperature without your having to ask. In good restaurants, wine is maintained in the cellar or wine cabinet at about 55 to 57 degrees Fahrenheit. This is a bit tricky, because that means there will be a delay in getting your bottle because the whites will need to be chilled a bit from the cellar, and the reds will need to warm a bit. But whatever the situation, it’s good to have an idea of the proper temperatures for serving wine, and ask the Sommelier for suggestions. And we’ll end on an interesting and contentious note: to decant or not. You decant mainly for one reason: to keep the sediment that forms in fine, older wines out of your glass. Others will decant to aerate young wine, which supposedly opens it to expose more flavors and aromas. Decanting may actually benefit young, tannic wines, making them seem softer on the palate, although there’s no solid evidence for this, only the assertions of the militant wing of the pro-decant movement. And sediment, while not harmful is distasteful to some, so if it makes you happy, decant away. Hey, wine looks lovely in a decanter, and it’s more fun to pour. My one caution is for very old wines such as 30-50 year old Bordeaux or Cabs that may have begun to oxidize. Decanting such wines may complete the oxidation process and make the wine undrinkable in under an hour (I have seen it happen). Makes a nice vinegar, though.